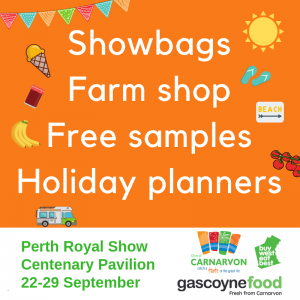 Gascoyne Food Council is teaming up with the Carnarvon Visitor Centre to bring you a fantastic display this year at the Perth Royal Show! Our new-look stand will be located in the Centenary Pavilion’s Walk Through WA displays. Visitors can Catch a Taste of the great life with a virtual reality swim with the whale sharks, pick up a Gascoyne Food show bag, try a Gelatino – Gourmet Artisan Gelato Sweeter Banana ice-cream, peruse the farm shop for delicious preserves, Harvey Beef jerky and Sweeter Banana Co-Operative Carnarvon WA banana bread or just chill in our mini-cafe and try a free sample of delicious fresh fruit, veg or Harvey Beef while you plan your next trip to the region. We have something for everyone so make sure to come and visit us! Posted in Gascoyne Food Events | Comments Off on Perth Royal Show!